When it debuted in 2002, the Buick Rendezvous crossed over all the lines that had previously separated sedans, minivans, and sport-utility vehicles. Rendezvous was, and is, a perfect example of the new category of crossover vehicles, a category that defies categorization. The Rendezvous combines aspects of SUVs, minivans, and wagons. Just don't call it a minivan or a wagon. Rendezvous is a versatile vehicle seating five to seven passengers. Its styling is nice. It has fine manners on the highway, a benefit of unit-body construction normally associated with sedans. Four-wheel-drive is available to cope with gnarly weather and marginal off-highway tracks with dignity. New for 2004 is the Rendezvous Ultra, which comes with a higher level of standard equipment and an all-new, more powerful and more sophisticated V6 engine. The Buick Rendezvous is priced well and easy to like, with solid engineering, useful flexibility, and a handsome appearance. The three-row interior compares favorably with the passenger capacity of costlier vehicles. Satellite radio, electronic navigation, and a rear-seat DVD system are available as options. Rendezvous is offered in five trim levels: CX, CX Plus, CXL, CXL Plus, and Ultra. All Rendezvous models have automatic transmission, four-wheel independent suspension, and four-wheel disc brakes. Rendezvous CX, CX Plus, CXL and CXL Plus are powered by a 185-horsepower 3.4-liter V6 engine, and are available with front-wheel drive (FWD) or all-wheel drive (AWD). Rendezvous Ultra comes with a new 3.6-liter V6 rated at 245 horsepower and all-wheel drive. CX FWD ($26,020) comes standard with cruise control, remote keyless entry, a theft-deterrent system, AM/FM/CD/cassette stereo, and power outlets for all three seating rows. CX AWD ($29,170) adds the all-wheel-drive system plus anti-lock brakes (ABS) and side-impact airbags. CX Plus FWD ($27,880) and CX Plus AWD ($31,030) add OnStar, a driver-information center, ultrasonic rear parking assist, manual dual-zone air conditioning and 16-inch alumium wheels. CXL FWD ($30,935) and CXL AWD ($33,140) add leather upholstery, six-way power seats, automatic dual-zone air conditioning, heated mirrors, premium eight-speaker stereo with steering-wheel-mounted controls, separate rear-seat audio controls and headphone jacks, tire inflation monitor, and unique exterior trim. Both FWD and AWD CXL models have side-impact airbags and ABS. Additionally, front-drive CXL's come with traction control. CXL Plus FWD ($32,420) and CXL Plus AWD ($34,445) add heated front seats, a memory function for the driver's seat and mirrors, a folding third-row seat (increasing seating capacity from five to seven), XM Satellite Radio, cross bars for the luggage rack and P215/70R16 touring tires (replacing the standard all-season tires of the same size). Ultra ($39,045) comes with all of the above, plus the more powerful 3.6-liter V6, leather seats with suede inserts, second-row captain's chairs, a six-disc CD changer, a head-up instrument display, and an electronic release for the rear liftgate. Tires are upgraded to P225/60R on 17-inch aluminum wheels. Nearly all of the features that come with the higher-line models are available as stand-alone options. Even the Ultra's more powerful engine is available as an option on CXL models. On models that don't come standard with them, we recommend adding side-impact airbags ($350), anti-lock brakes ($600), and traction control ($175) for their safety benefits. A power sunroof ($885) is available on any Rendezvous except the base CX, and you have to spring for at least a CXL before you can order DVD entertainment ($1,100) or the multi-media/navigation system ($1,995). A towing package ($325) is offered on all models, and includes a high-output alternator, transmission oil cooler, heavy-duty engine cooling and automatic load leveling. Properly equipped, Rendezvous can tow 3500 pounds. It is difficult to judge the size of the 2004 Buick Rendezvous without the context of another vehicle near it. That's usually a sign that the design team got the scale right. The spec sheet says that Rendezvous is as tall as an SUV, at 68.9 inches without the roof rack. But with nearly 64 inches between the left and right tires, Buick claims that the Rendezvous has a wider track than an SUV. Rendezvous' strong horizontal design visually suggests stability as well. The Rendezvous' traditional Buick grille emphasizes a familial resemblance to the Park Avenue, but it somehow looks less formal and more cheery. It's a pleasing countenance. On Ultra, the familiar grille is body-color rather than black. Bright inserts along the top of the side molding add a look of richness to Ultra. The Rendezvous is probably not beautiful to many, but it has an integrity suited to its purpose and is thus attractive. In short, we like its looks. Rendezvous can seat up to seven passengers or two people with scads of stuff. The seating setup depends on how you order it and then on how you choose to fold and configure. Second-row captain's chairs are standard on Ultra, but an elegant choice ($435) for all but the most basic CX, replacing the standard 50-50 split bench seat. The Rendezvous works well as a cargo hauler and the flexibility of the seating configurations is an exercise in automotive origami. The seats fold and tuck and fit into an amazing number of arrangements. Even the second-row seat flips and folds, allowing you to have two people up front and a flat floor behind without leaving anything home in the garage. The available third-row seat folds flat into the floor. For maximum cargo capacity, the center row can be removed. Hiding places and lockable bins are strategically placed here and there. When ordered without the third seat, CX Plus and CXL come with a cargo storage system that includes a sliding tray. Even with seven inches of ground clearance and all-wheel drive, getting in and out of the Rendezvous is more like getting in and out of a sedan than an SUV. Small children, arthritic knees and tight-skirts can be grateful for that. All seats are easy to access and quite comfortable. Wood accents, a wood-trimmed steering wheel, and a bit of chrome around the gauges and dials add visual interest to the Ultra. And the Ultra's leather seats feature suede inserts. The Ultra's head-up display (a $325 option on CXL and CXL Plus) projects salient information on the windshield (low enough to be unobtrusive but clearly visible). This allows the driver to read, with a minimum of eye deflection, the car's speed and radio or CD information. Access to the third row is far simpler than in most vehicles with three rows of seats. Once back there, the third row is pleasantly suitable for two full-size adults. And the third row is no Siberia: Even from way back there the acoustics allow you to participate in conversations with the front-seat passengers. The load-height is low, reducing back strain when loading or unloading heavy objects. The rear opening is wide enough to slide a 4×8-foot sheet of plywood in flat. A red flag affixed at back will have to deal with the length. The amazing thing about the low stance and flat floor of the Rendezvous is that all-wheel drive and a low, flat floor are supposed to be mutually exclusive. Well, the Buick engineers found a way to do it. Too bad being unobtrusive is a mark of success because this accomplishment needs to stand up and take applause. It's best appreciated when driving with a full load of people and their stuff on a nasty, sleety, darkening afternoon with a slippery glaze on the street. On the downside, the plastic used for the instrument panel doesn't measure up to the rest of the interior. The optional XM Satellite Radio features 100 coast-to-coast digital channels, including 71 music channels (more than 30 of them commercial-free) and 29 channels of sports, talk, children's and entertainment programming. The DVD system includes a fold-down seven-inch monitor integrated into the ceiling. OnStar, standard on all but the base CX, works well as a navigation system because there's nothing to program. Press the button and a human operator responds, to provide directions and other assistance. OnStar always knows the location of your vehicle. The staff will notify authorities of your location if your airbag goes off and you do not respond to their calls. Or you can press the emergency button and they'll send out the troops. They can unlock your doors if you lock the keys inside. They can direct you to the nearest gas station or help find a good restaurant or motel. If your vehicle is stolen, OnStar can pinpoint its location and direct the authorities to apprehend and recover. 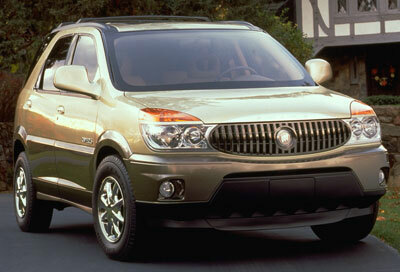 The Buick Rendezvous rides more smoothly and offers more responsive handling than a sport-utility vehicle. Its long wheelbase smoothes surface irregularities without the road vibration inherent in many SUVs. Overall, the road demeanor of the Rendezvous is pleasing. It stopped well, and was quiet for an SUV, though a little road-noisy by luxury sedan standards. Yet the Rendezvous does surprisingly well in treacherous conditions when equipped with all-wheel drive. In some sandy and rocky arroyos, the SUV side of the Rendezvous' personality came to the fore. Its all-wheel-drive system, called Versatrak, requires no input from the driver. Versatrak drives just the front wheels until sensors agree that some traction assistance from the rear is advisable. Versatrak is clever: Power is meted out separately and individually to each rear wheel, not just to the rear axle. That is a fineness of traction disbursement not available in most other four-wheel-drive systems. The result is better traction and increased stability, making the Rendezvous more capable in the snow and easier to drive in the slush. With its 185-horsepower 3.4-liter V6, our CXL Plus test vehicle accelerated with reasonable aplomb. This engine uses an iron block and pushrod-operated overhead valves. We expect the Ultra to accelerate more quickly. The Ultra's 3.6-liter V6 is an entirely new and different engine, with all-aluminum construction and dual overhead camshafts. A 32-bit microprocessor continuously adjusts its valve timing according to conditions; GM calls this technology VVT (for Variable Valve Timing). The same computer also manages this engine's more advanced fuel injection and coil-on-plug ignition systems. In short, the overhead-cam 3.6-liter V6 is a more modern, more sophisticated design than the overhead-valve 3.4-liter V6. And the new 3.6-liter produces significantly more power: 245 horsepower at 6000 rpm and 235 pounds-feet of torque at 3200 rpm. More important, 90 percent of the new engine's peak torque is available between 1600 and 5800 rpm. That means that a strong surge of power should be instantly available at virtually any driving speed. Fuel economy hardly suffers: Preliminary ratings show 17/24 mpg city/highway for the more powerful 3.6 vs. 18/24 mpg for the 3.4 with AWD. GM claims reduced emissions as well. The load-leveling suspension, available as part of the trailer towing package, uses compressed air to fill bladders in line with the rear shock absorbers. The air pressure keeps Rendezvous level when carrying a heavy load or towing a trailer. The system comes with an auxiliary air outlet, rubber air hose, and pressure gauge, for inflating tires or toys. Buick Rendezvous is as comfortable as it is practical. It offers a smooth ride, reassuring road manners, and a pleasant cabin. It can be configured to haul six adults in comfort or a load of lumber from the home-improvement center or a combination of people and cargo. Rendezvous deserves a look on the basis of economy alone. In the first place it uses regular unleaded gas, not premium and its thirst is temperate for its size. The new Ultra model promises dramatically improved performance. Meanwhile, all other Rendezvous models offer attractive value, with a compelling price and decent fuel economy for their size. Rendezvous is priced significantly below such luxury all-wheel-drive vehicles as the Lexus RX 330 and Acura MDX. Head/hip/leg room, f: 40.9/61.1/40.5 in. Head/hip/leg room, m: 40.1/61.1/39.0 in. Head/hip/leg room, r: 37.5/48.3/34.6 in.